Two people were killed and two were injured when a Kinder Morgan natural gas pipeline exploded in Illinois on Tuesday, the company has confirmed. The U.S. District Court for the Western District of Oklahoma has ordered a natural gas pipeline operator to cease operations and remove the pipeline located on original Kiowa Indian lands Anadarko. Members of Unis’tot’en camp, November 2012. 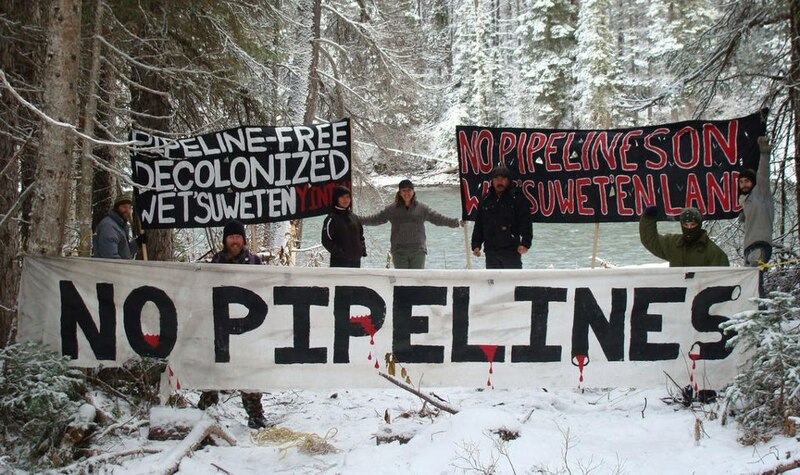 Great news: Unist’ot’en Camp has successfully stopped police and pipeline surveyors from entering their indigenous territory in Northern BC for another year. Now we learn that executives with Coastal Gaslink are (quietly) seeking to change the fracked gas pipeline route. Tension remains high in Northwestern BC as representatives from the Unist’ot’en clan and their legal representatives held a meeting with the RCMP regarding the fate of their settlement camp on Tuesday afternoon. A non-violent occupation of unceded Unist’ot’en traditional territory since 2010, the camp was originally established to stand in the intended path of the Pacific Trail natural gas pipeline. 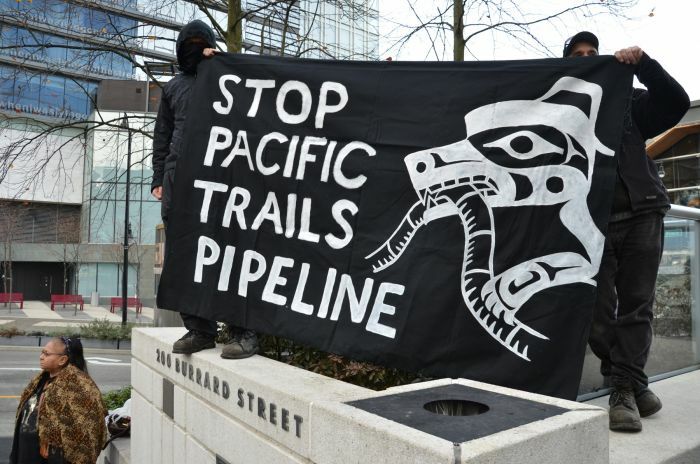 It has since expanded to include structures built directly in the path of the Enbridge Northern Gateway pipeline and the TransCanada Coastal Gaslink pipeline, encompassed within a sweeping declaration that all pipelines are banned from their territories. A checkpoint ensures that no one enters or leaves the territory without their direct consent. The Wet’suwet’en First Nation saw a massive groundswell of support from across British Columbia following rumours that the RCMP was preparing to move on a camp that stands in the way of proposed gas and oil pipelines. But not everybody within the Wet’suwet’en Nation is happy about that, including four elected chiefs. Today (August 31), Wet’suwet’en chief Karen Ogen, Nee Tahi Buhn chief Ray Morris, Burns Lake Band chief Dan George, and Skin Tyee Nation chief Rene Skin issued a media release that distances the First Nation as a whole from the camp’s actions. Going further, it denounces the camp’s goal of blocking pipeline developments. 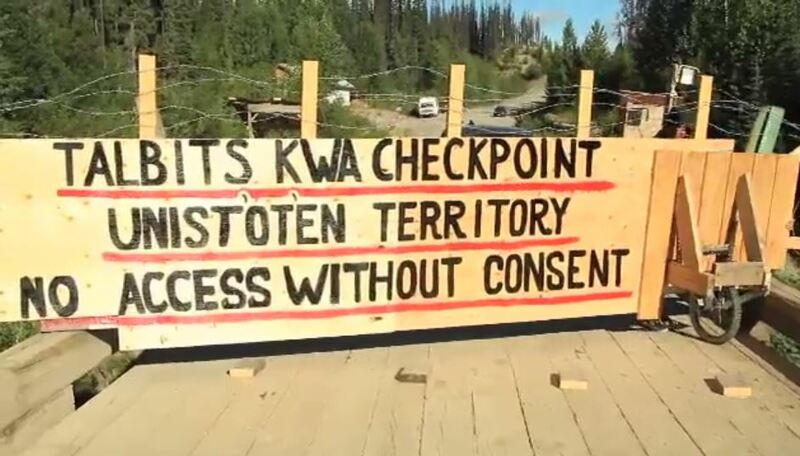 Gate at Unist’ot’en camp, photo: Al Jazeera. HOUSTON, British Columbia — In a remote mountain pass connecting the Pacific Coast to the interior of British Columbia, a region brimming with wild berries and populated by grouse and grizzly bears, felled and painted trees have been laid across a logging road to form an enormous message. Directed at air traffic, it reads “No pipelines! 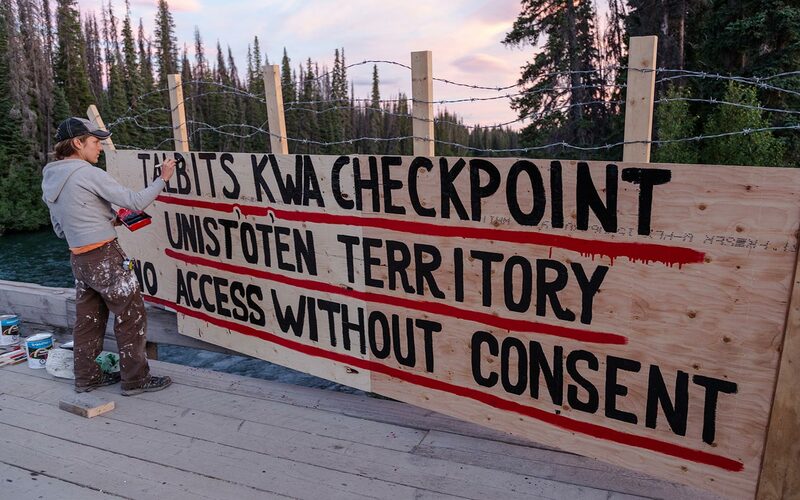 No entry!” The warning marks off land where the government of Canada and a First Nations clan hold irreconcilable views of what should happen to a 435-square-mile area each claims as its own. 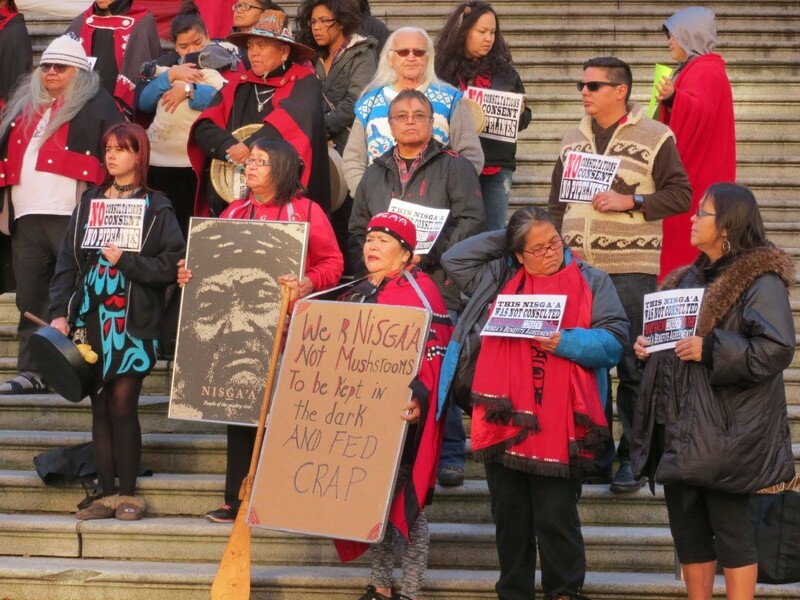 Members of the Nisga’a nation in Vancouver protest signing of deal with natural gas project. A nation is only as good as its leadership. Take the Nisga’a, the first nation out of the modern-day treaty gate 14 years ago. 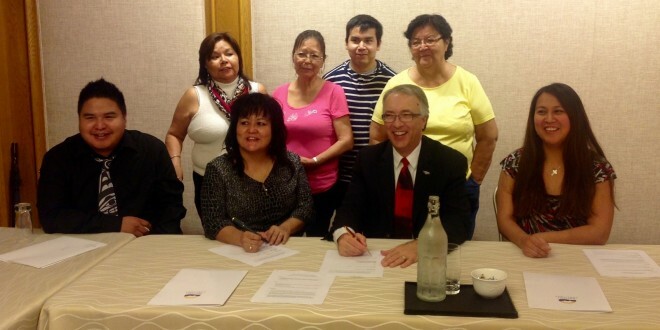 The Nisga’a Lisims government just signed a benefit agreement regarding the Prince Rupert Gas Transmission liquid natural gas pipeline with TransCanada and Pacific NorthWest LNG. 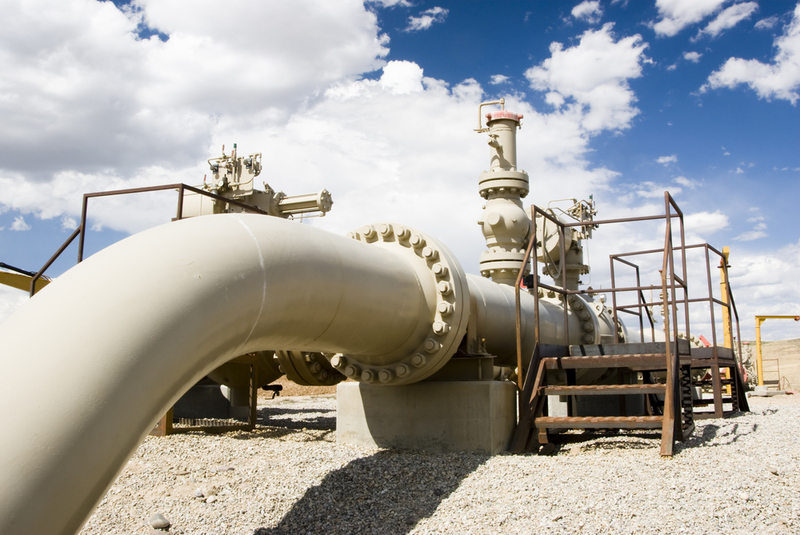 EDMONTON — Police say someone with a rifle blasted a hole in a high-pressure natural gas pipeline in western Alberta some time over the weekend. Mounties responded Monday to a report of damage to a Talisman Energy pipeline 300 km west of Edmonton. A large quantity of natural gas was released into the atmosphere before safety devices on the pipeline shut down the leak. Banner at solidarity rally with Unis’tot’en camp, Vancouver 2012. CALGARY – A liquefied natural gas project planned for Kitimat, B.C., faces an uncertain future after one of its U.S. partners announced plans to get out of the LNG business. Apache Corp. said in its second-quarter news release that it plans to ditch the Kitimat LNG project, which it was developing alongside Chevron Corp., as well as the Wheatstone LNG project in Australia. The Houston-based company has been under pressure from activist hedge fund Jana Partners LLC to restructure.